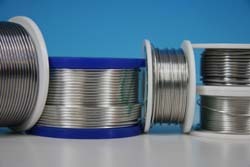 Cerasolzer is used in manufacture of electrical parts, to contact electrical / electronically materials and flat glass / metalized glasses because it provides a unique bonding technique that can take the place of commonly used silver baking, indium soldering, molybdenum-manganese and resin (flux) bonding methods. Glass, Ceramic, Aluminum and Stain-less Steel are commonly known as non-solderable materials with conventional soldering systems. Heating is not enough to overcome this obstacle. Ultrasonic vibrations in conjunction with heat cause the required effect and delivers the technical break through. This principle is based on the scientifically recognized 'Ultrasonic Cavitational Phenomenon' which is caused by strong ultrasonic penetration.